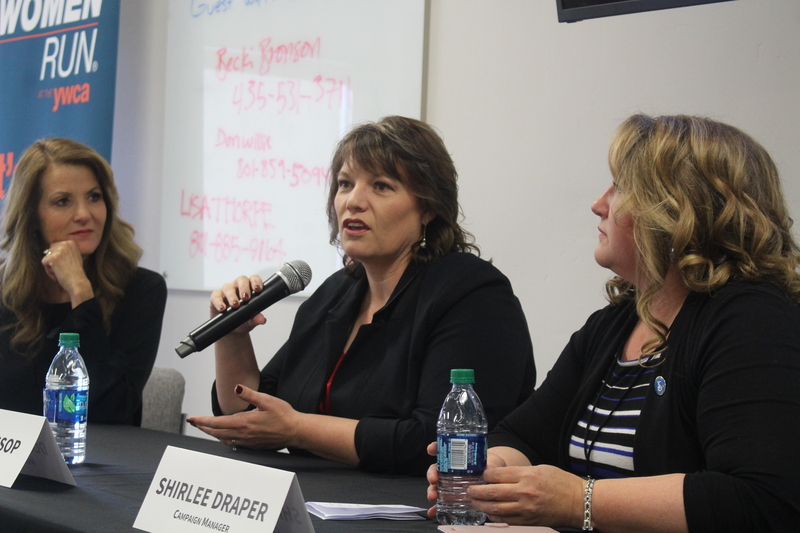 ST. GEORGE — Women — from elected officials to those hoping to run for office or any other leadership capacity in the future — gathered in St. George this weekend to train on how to publicly serve communities. 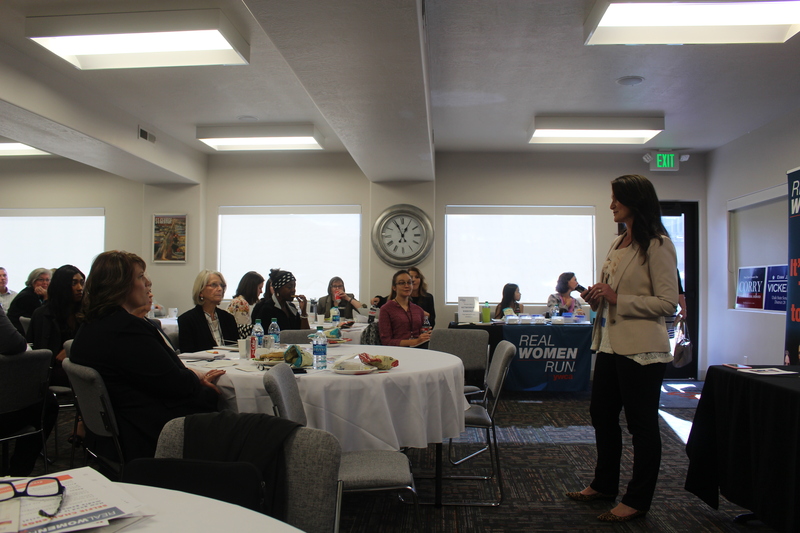 Real Women Run, a collaborative and nonpartisan initiative that empowers women to participate in public life and civic leadership through public office, held its annual Southern Utah training Saturday at the St. George Area Chamber of Commerce building. 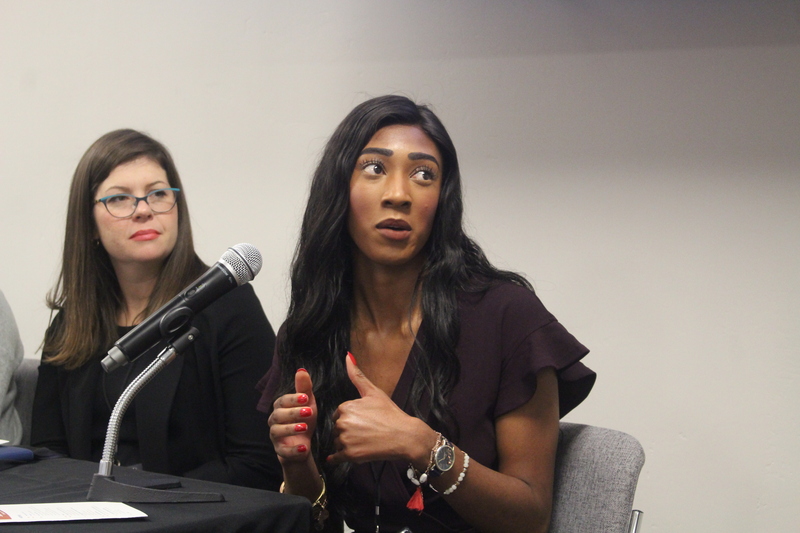 Speakers included both women and men and covered an array of topics to help inspire women, such as how to effectively run a campaign, creating paths to public service and constructing solutions through community engagement. Saturday’s training started with Nina Barnes, board member for Real Women Run, asking attendees in the room if they were thinking of running for a political office in the future. The majority of the 50 or so women in the room raised their hands. Southern Utah state Rep. V. Lowry Snow also addressed the women in the room. What proved to be a theme during the first session was that any woman can be involved in public service. LaRene Cox, Washington County School Board member and president of the Utah Federation of Republican Women. Miriah Elliot, Ivins City Council Member. D’Mia Lamar, student body president for Southern Utah University. McKenna Mathie, Pre-Law Club president at Dixie State University. When discussing leadership and political positions in public service, all four women agreed that you “just have to go for it” when wanting to run for those positions. For Lamar, landing a position as student body president came after a progression of other leadership roles, such as being a school ambassador and senator for SUU’s college of humanities and social sciences. She ran for student body president because she knew it was her calling. “I’m kind of a quote person … and one of them is that, ‘There’s someone or something out there waiting for you to do what God has called you to do,” she said, adding that she ran because she didn’t want that someone or something waiting for her too long. Campaigning differences between men and women also became a topic of discussion. Besides campaigning for herself for a school board position, Cox has also helped run other political campaigns, including her husband’s — Dean Cox, who serves as a Washington County commissioner. All panelists agreed that they became successful in their positions by getting out of their comfort zones, whether that was talking to voters face-to-face or running for a position they never thought they would be qualified for. Although it may be easy to complain about what’s going wrong in your community, Nancy Hauck, associate provost of community and global engagement at Dixie State, said if you complain without offering a solution, then you become part of the problem. She then invited women in the run to think about how they could be the solution to problems facing their communities. While discussing some problems facing the state and Southern Utah communities, like poverty, land use and health care, Hauck said women can be part of the solution by running for some sort of leadership or political office. However, she said they can’t do it alone and shouldn’t be afraid to ask for help. Hauck ended her speech by saying women don’t have to be a part of the solution by running for political office. They just need to be passionate about something and find ways to become invested in it within their communities. As Donia Jessop, Hildale’s first female mayor, and her campaign manager Shirlee Draper came to the front of the room, Barnes described them as being one of Real Women Run’s great successes. 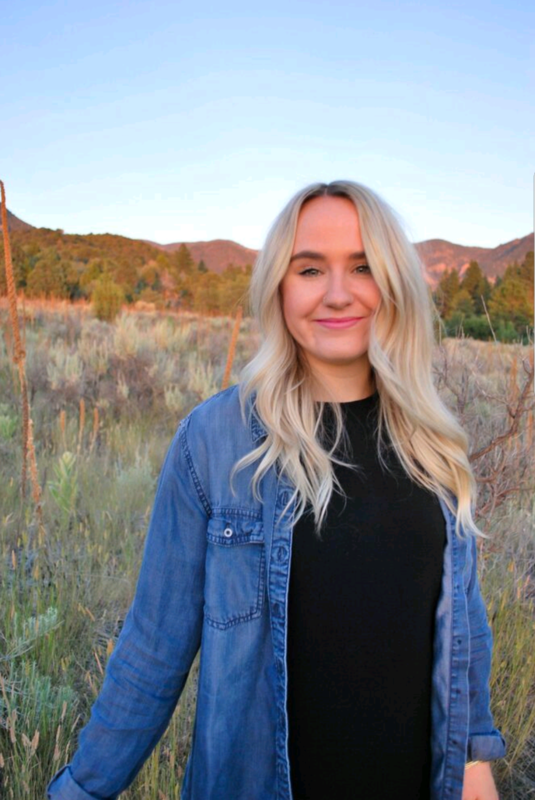 Jessop is also the first person to take a leadership role in Hildale as a nonmember of the Fundamentalist Church of Jesus Christ of Latter-Day Saints; she left the church six years ago. She said she ran for mayor because she’s passionate about people. Jessop and Draper became best friends in seventh grade, but Draper left the FLDS church 15 years ago. Nevertheless, Draper did return and became a member of the UEP Trust Board in Hildale. While going back to Hildale and attending board meetings every month, she realized how the community was changing and that the FLDS members weren’t the majority population anymore. So, she said she began going door to door asking people to register to vote and participate in the political process. After hearing the majority of the community saying their votes don’t count, Draper began holding monthly community meetings. While attending the first-ever meeting, Jessop said she spent the whole time strategizing on how to change the community. Choking back tears, Jessop shared why she left the church and how that helped her realize she would be a good fit for mayor. 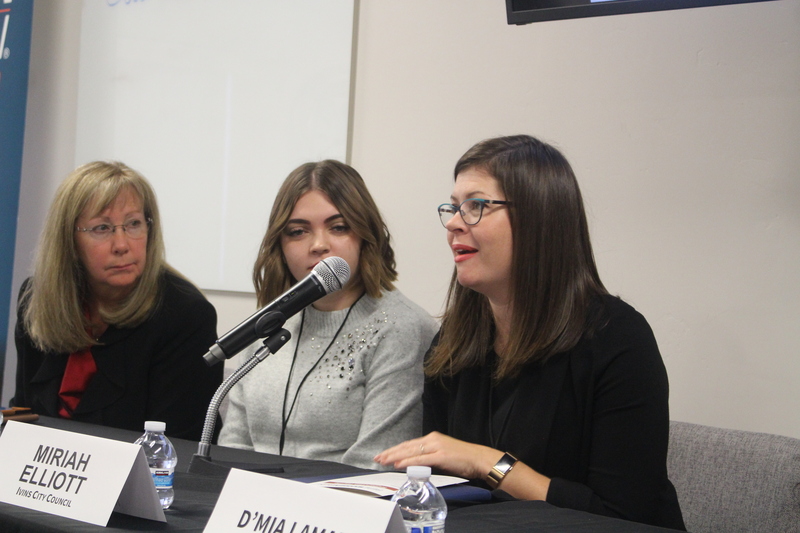 “I knew on a very personal level the trauma and the pain, so I could connect,” she said, adding that Hildale needed personal connection in its government. Jessop said women need to step up and “take their place at the table,” because if they don’t, communities won’t hear their point of view. In theory 50% of elected politicians should be female based on demographics. So RIGHT ON. Let’s get more women in political positions. That also goes for my local Santa Clara City council as well. One of my favorite council members is Mary Jo Hafen, who I worked with briefly on the historical committee years and years ago. She is smart, innovative, and fair minded. Diversity brings strength, and more women are needed especially in local governments. Good luck and let’s see more women on the ballot. It will do us all good!